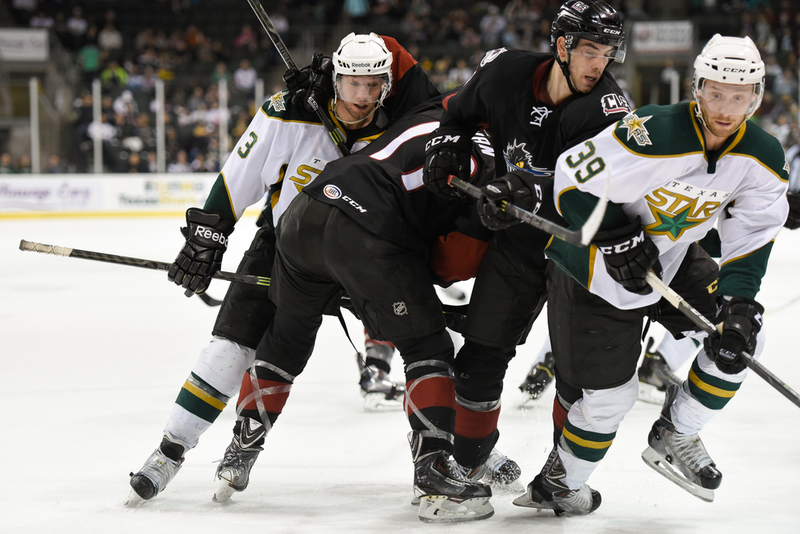 The Lake Erie Monsters were back in town last night for a rematch against the Texas Stars. The Stars won both games, taking this game in a nail biting shootout finish. Travis Morin scored the winning goal for the Stars. Jussi Rynnas started in net for the Stars and was taken out of the game with a lower body injury following a collision in his crease. Jack Campbell stepped up and did a terrific job keeping the Stars in a winning streak. The first shot is the opening goal for the night by Branden Troock. The second shot is something I saw but the ref didn't. Travis Morin was held up in a head lock off of a face off by Ryan of the Monsters. Umm...holding?! The third shot is Jack Campbell deflecting the Erie's final shot of the shootout, sealing the win for the Stars. I also took the GoPro so enjoy some bonus video highlights.